Forum Guide, Netiquette & Help for logged out users. A One Stop shop for all the best cats toys from around the world! The place to post any cats that are looking for loving homes. For your transport requests and relay info for rescue cases here. Place to admire (ooooos & ahhhhs!) our babes. Please sign and support these important cat related Petitions.Thanks. Cat welfare articles and News- Possible upsetting cases. Cat Health & Behaviour , advice & Help. Purrs advises that in any case of concern about a cat’s health, you should always consult a fully qualified veterinary practitioner as your first priority. If you are considering any additional complementary therapies or treatments for your cat, we strongly advise that you discuss this carefully with your vet first. 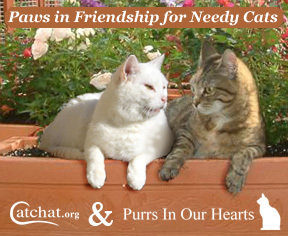 Help & Advice & Support with FIV & FELV cats. Lost & Found cats, advice, help & support. For all our cats up on the Bridge, always with us, in Our Hearts. Here please post where we can help - non cat related. - Possible upsetting cases. The place to post re non cat rescue cases. Urgent cases only please.